Dr. Fred Labavitch graduated from Ohio State University in 1966. He immediately joined the US Air Force and became a member of a special research project that saved the lives of thousands of service dogs. He was also the Air Force Base Chief of Veterinary Services in Portland for the Oregon Air National Guard for 18 years. Dr. Fred opened Sunset Animal Clinic in 1972. In 1973 he was a founding member of Dove Lewis Emergency Clinic in Portland and served on the Board of Directors. In 1974 Dr. Fred started the Veterinary Technician program at Portland Community College. In 1983, Dr. Fred began a Veterinary Cancer residency at the University of California, Davis, and fulfilled that residency in 1986. He then returned to Portland and opened the Animal Cancer Clinic, the first veterinary practice in Oregon dedicated to animals afflicted with cancer. Animal Cancer Clinic offers multiple cancer therapies including surgery, chemotherapy, radiation therapy, hypertherapy (heat) and hypotherapy (cold) treatments. During a stressful time for both pet and owner, all treatments are performed with compassionate care. Diagnostic modalities provided to pet patients include MRI, cat scan, digital ultrasound and radiography. Dr. Fred shares his family home with a calico cat named Essence and 3 dogs: Pearl, a Bernese Mountain dog, Lucy, a Saint Bernard who Dr. Fred adopted as a sick puppy when her original owner decided not to pursue treatment, and Navar, a Shih Tzu who Dr. Fred brought home after attending an ultrasound class in Dallas, Texas. Navar, a shelter dog, was being used in as a patient in the class to demonstrate ultrasound techniques. 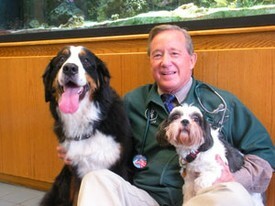 Dr. Fred actively practices veterinary medicine at both Sunset Animal Clinic and Animal Cancer Clinic six days a week.